JFK once stated, “Ask not what your country can do for you, ask what you can do for your country”. Today’s Bloggerview is with my teammate, Tom Morrissey. We work together on the cross brand initiatives, but have successfully solved analyst issues in Software Group for years. As you read through this, you see that he has been and is willing to go above and beyond the call of duty both for analysts, our team and personally. Tom as you’ll read helped at ground zero after 9/11. There are some guys you want in your foxhole, I’d always want Tom in mine, for analyst relations or any other engagement… friend or foe. I’m a dot-com ‘boomerang’ IBM employee. I started with IBM in 1984 as a Large Systems Engineer on a team supporting a large insurance company. After different positions in Marketing and Product Management (I was Brand Manager for the under-appreciated IBM AntiVirus product), I left IBM in 1999 to join MAPICS and then a dot-com company. The dot-com experience was interesting. I was the Director of Marketing for a Job Board site for IT professionals. In 2001, I returned to IBM (don’t ever burn your bridges) and, as you can imagine, I have been happy to be back. While I enjoyed my other experiences, I found that I took some things for granted at IBM which don’t necessarily always exists elsewhere. Like IBM’s culture of mutual respect and customer service. One of the reasons I had trouble “getting deals” when I was at the dot-com company is that the CEO wanted ‘win-lose’ deals. The notions of trusted relationships and true partnerships were alien to him. How do you describe what you do to those not in our profession? Analyst Relations is a Communications position so a lot of my day is on the phone with analysts to brief them on IBM announcements and strategies. Or I’m on the phone with other IBMers in various staff or project meetings. Being in IBM Software Group, I love being in the forefront of the changes currently occurring in the IT marketplace. Linux, Open Source, Software as a Service, SOA. And after spending so much time with analysts on the phone, its always enjoyable to talk to them face to face at conferences. For all the “communicating”, I think there are still knowledge and relationship gaps between IBM and analysts. I think blogs are useful to bridge some of these gaps. I would like to find ways to increase the dialog and rapport that occurs at conference events and increase the opportunities for meaningful discussion. As readers of this blog know, IBM has a very successful Business Partner program who we partner with to provide industry/customer solutions to the marketplace. Yet, with recent industry acquisitions and consolidation, some firms have questioned the viability of IBM’s partner-led application strategy. After several briefings with a leading firm/critic on this topic, it was a very satisfying last year to see IBM presented at a major firm conference as the “hidden” fourth player in the market on par with the other 3 major application vendors. What would you like the analyst’s to do differently, suggestions of what would help both sides maybe. I think every firm should publish/update their research agenda. More transparency of the agenda would make it easier to coordinate our briefings/consults with them at the right time. I think Forrester’s move to publish their research agenda on their web site should be a standard practice for all firms. Can you talk about your military service, why you did it, what you did? I enlisted in the Marine Corps Reserve in 1986 when I was 26 years old, college educated, and working at IBM. Notice I said enlisted. This meant that despite my age and education, I went to Parris Island for boot camp with 75 (about 48 graduated) other ‘pukes’ in my platoon as a Private. I was older than most of my Drill Instructors who, for their part, were impressed (meaning I got to do more push-ups) that someone like me enlisted. But I wanted to know what the experience was like and how I would do. It was a personal test kind of thing for me. Of course, my parents and some of my friends thought I was crazy and, in fact, I was talked out of joining twice before I finally made the commitment. It took a while but I finally realized that I would regret NOT doing it more than I would doing it. That perspective was a decision-making breakthrough for me in dealing with unknown situations. I’m often asked about boot camp and how difficult the Marine Corps training is. For me, it wasn’t really as physically difficult as I expected although I did train hard before going to Parris Island. However, it was much more mentally stressful than I expected. Having someone shout at you constantly day after day, week after week…the never-ever-satisfied demands of the Drill Instructors who constantly belittled your efforts…your total lack of control of your situation….Very difficult to take. Interestingly, the seventeen and eighteen year old’s didn’t seem to mind it – they were more challenged by the physical training, not the mental training (too young to know better, I told them – lol). But the mental stress part was indeed part of the training method and I can tell you that the ‘tear-down, build-up’ method is definitely effective in creating a highly motivated unit from heretofore dozens of diverse individuals. Following boot camp , I became a Radio Operator which is essentially a grunt with extra radio gear to carry. 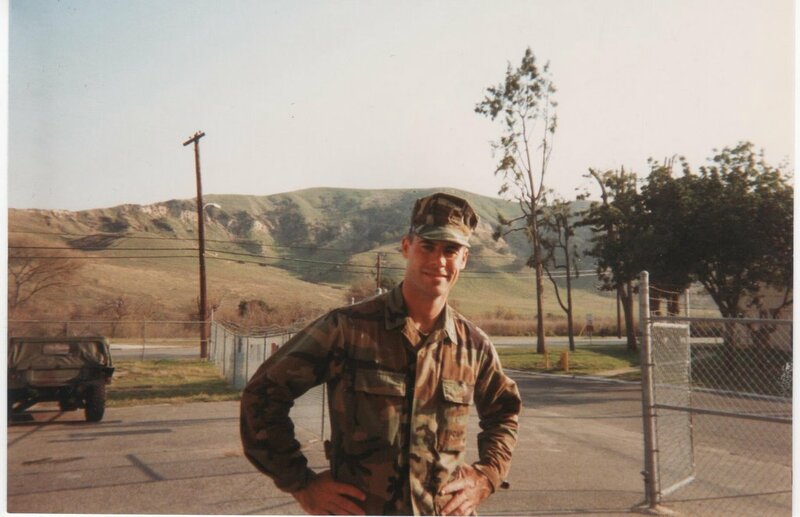 By the time my 6 year reserve contract finished, I was a Sergeant and our unit had returned from 4 months active duty training in the Mojave Desert during Desert Storm in 1991. Our unit was supposed to part of the replacements troops following the Ground War but ultimately most Reserve Units were deactivated before reservists could attain Veteran status and the benefits that come with it. Needless to say, The first Gulf war was a much different situation than the troops are in today. 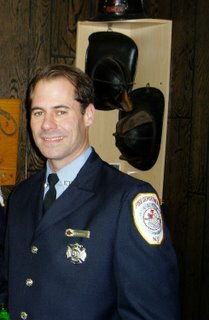 Are you really a Fireman currently also? Yes, I’m a volunteer Firefighter in my hometown. My family teases me that I just like being in uniform. Actually, I like physical challenges and helping people. Five months after I joined the department in 1991, we were called to help the Rescue Effort at Ground Zero (many people forget that the fires burned underground for months). Most of the time, though, the alarm calls that I answer at night and on weekends are false alarms- fortunately- and I’m just a little more bleary eyed for the effort in the morning. And it’s always amusing when the false alarm is at a friends house who just burned their Thanksgiving turkey. But the training is strenuous. To be a trained firefighter, you need to complete an 80 hour course with simulated and live fire training exercises. The turnout gear is heavy and hot even before going into a fire. When you’re inside a burning room with an air-tank, you can barely see or hear anything because of the noise and inherent confusion at each scene. Like my reserve experience with the military, my volunteer firefighter experience has taught me great respect for the Professional Firefighter. As a Volunteer Company, we train once a month and respond to calls when we can. Professional/Career Firefighters usually respond to several calls everyday – and at every hour of the day. Tom is my son and this is the first time I have understood what he does at IBM. However, I do understand that he is one great son and I could not get along without him to fix my TV, set up my DVD and help my wife maintain her sanity!! I love the guy. Like your blog a lot – nice to see other IBM’ers in the blogosphere!